Hopefully you will never be or have someone close diagnosed with Cancer, but f you find yourself in that position focus on these silver linings; Cancer affords families with perspective, and allows for insight into the futility of things great emphasis is often placed. For example importance of houses, cars, status, and appearance, but when fighting Cancer hopefully you can see how in reality these things are insignificant. Cancer brings with it realization that stress; conflicts, bad drivers, running late, work woes, and other problems, are moments we long for, along with health, but not things deserving the stress we have given them. During this battle, I continually heard my husband say the only thing that matters is “you, God, and family/close friends, the rest we don’t worry about”. With our daily stress, and problems which seemingly compound by the hour, how can someone simply not worry, and how can I put God and myself first? As I’ve battled and endured treatment for Stage IV Ovarian Cancer I’ve, not always successfully maintained my stress levels, but attempted to by reminding myself each day about what’s important. For myself I found I can’t simply think about what I am thankful for, because the mind is tricky. In the midst of attempts to remain thankful I get caught up in the worry we all succumb to at times, and often rightfully so. To achieve a full spirit of thankfulness I’ve found writing down or saying out loud at least five things I am thankful for each day has the ability to turn doom and gloom into a reminder of the blessings I’ve been afforded even when feeling crummy. Despite how bad things are, or how worrisome things have been, through thoughtfulness I was always able to find at least five things to be thankful for; the right nurse on a tough chemo day, family who sacrificed time to sit with me, doctors who invest their energy in research for a cure, and moments to appreciate my surroundings. Tarah’s graduation with her MSW (2013). Thankfulness is key, but in the battle against Cancer we also must learn how to prioritize things needing our attention,and letting go of things not within our power. We all want to be superheros, and in fact our society glorifies multi-tasking, perfectionism, and ability to blast on social media how well we maintain the superficial ease in presenting as a”Pinterest superstar”. This, however, is not the attitude or priorities conducive to fighting Cancer. My advice for the fight is to learn to let go of valuing yourself based on the amount of tasks you can accomplish or complete, but instead learning to reach out for help when needed, while valuing the community established from connecting with others. Underlying social norms tell us reaching out for help shows weakness, but I am here to tell you asking for help is a sign of strength and maturity. Not asking for help is as fear-based a decision a human being can make, and can lead you quickly in the wrong direction. For those reading this who know someone battling Cancer, and are onlookers of the devastation, don’t wait too long before you take action. Feel free to take it upon yourself to do something for someone who is struggling, because you are mindful asking for help is not always easy. Be thoughtful in how you proceed in helping patients and families, but don’t be pushy, or feel accomplished by the simple extension of, “Call me if you need me”. Patients and families don’t need words or sympathetic smiles, they might just need a hug or a kind gesture. Something I have learned the hard way in my Cancer battle is to not let myself sulk or feel depressed for too long. We all need a couple days every now and then to be sad, and rightfully so, but allowing despair to go too long opens opportunity for darkness to consume an individual. I suggest reaching out to someone before you start day three shrouded in despair, and combat dark days with a game plan by asking family or friends in advance if you can call them when the roads gets weary, because weariness is a guarantee. As you reach out to those around you I also recommend you find an organization who is serving people and communities encased in hopelessness from unfortunate circumstances. A study recently showed humans who did something for someone else were overall much happier, felt fulfilled, and were able to readily change negative perceptions about their situations. I know Cancer is horrible, and it seems like the worse thing, but I promise with just a quick Google you will find someone else going through more. For me, I focused on those who also were fighting Cancer, but had little resources or supplies for the battle. I was overwhelmed when I recognized there are people facing Cancer with no support, no money, no resources, and no healthcare, and in response have started the 501c3 organization Tenaciously Teal (Find us on Facebook). I know Cancer doesn’t allow you time to do a lot, but as you fight to conquer Cancer find something to take your mind off yourself, and learn the fulfillment that comes from serving others with something as simple as a card. Lastly, when you are facing a Cancer diagnosis don’t ask the question of WHY?, but HOW? How will you overcome Cancer? 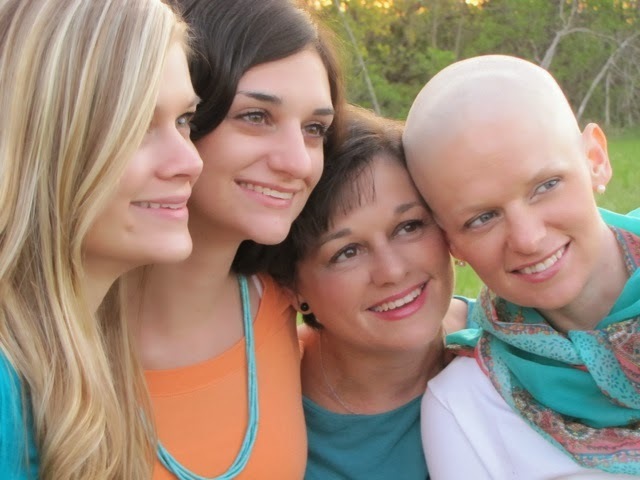 How will you and your family be better because of Cancer? How will you ask for help? How will you reach out and to whom? How will you learn from this? How will you prepare for the battle ahead? And How will you maintain a spirit of thankfulness? Realize a Cancer diagnosis does not equate to ” the end”, your story is not is not over yet, and the beauty of your life stretches way beyond its’ frame. Tarah and her husband, October 2013. Kept fighting and realize…It gets better! If you or someone you know is struggling with a Cancer diagnosis please feel free to contact me at tenaciouslyteal@gmail.com. I will cry with you, direct you towards resources to Conquer Cancer, and most importantly I will pray for you! Thank you my dear friend for providing these words to my friend, to me and now to everyone! This advice is helpful in so many ways. Thank you! I am glad it had helped someone. I have said before I do it to help just one! Much Love to you and the ones you love! I've said it before, but I'll say it again, you my dear child amaze me….. I Love You and Pray for you often!! Thank you for the many prayers Cheryl and thanks for wearing Teal today!